I was binge watching some card making videos over the weekend. I came across Kelly Latevola’s video where she coloured the flower edges with copic markers instead of the whole flower. She saw Jana Millen’s card with this technique and tried it. I loved how the flowers looked. So I thought I will give it a go and I added my own touch to it by adding texture. Hello and welcome. 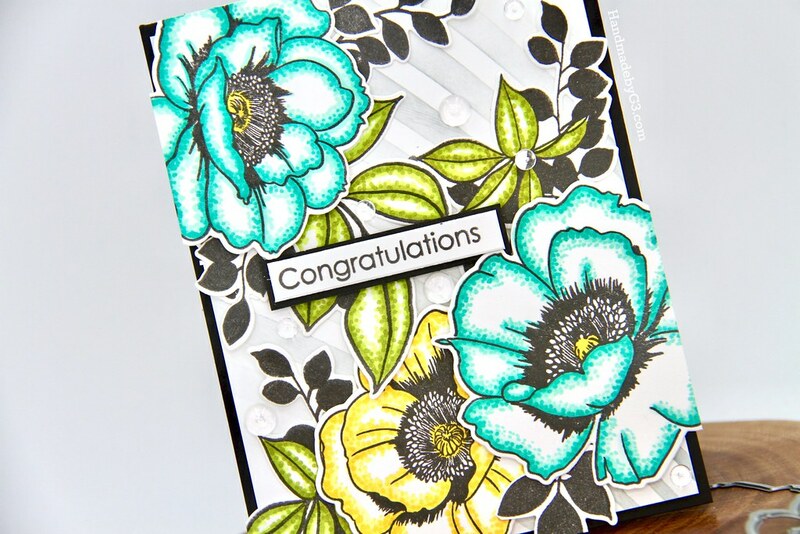 Today I have a floral card to share with you using Altenew’s Wallpaper Art stamp set and coordinating dies. 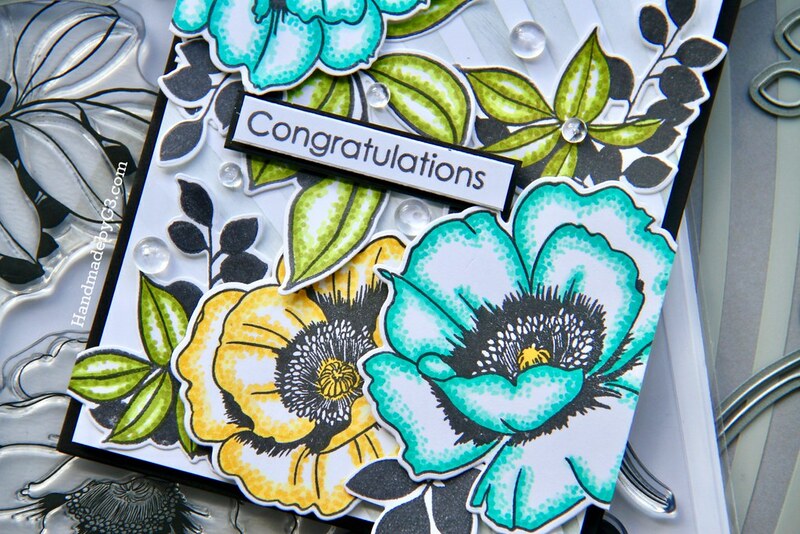 I stamped the images on Neenah Solar White 80 pound cardstock using Altenew’s Crisp Black ink. Using Altenew’s Artist markers I coloured the flowers and leaves. I picked two lighter shades of each colour. I will list them below in my supply list for you. To soften harsh lines from the darker shade, I used the lighter shade to brush and blend. Then using the same two shades but with the bullet nib, I added texture to the coloured area. Darker dots on the darker areas and lighter dots over and extend out of the darker areas. This type of colouring is easier and quicker especially if you are running short of time. Using the coordinating dies, I die cut them all out. 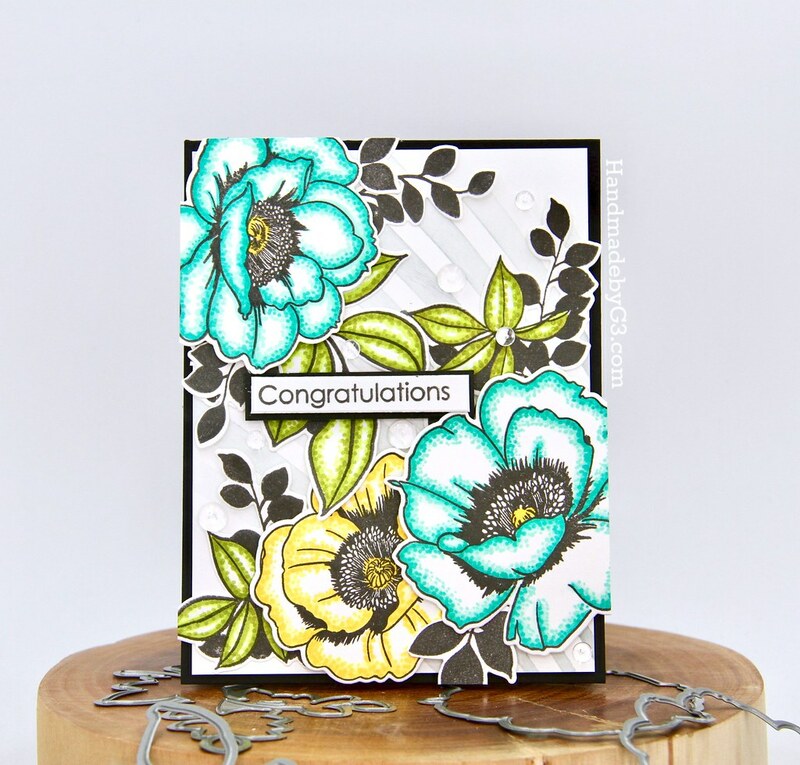 On the background, I used the Molded Lines stencils and Weathered Wood distress oxide ink to add interest to the background. The I clustered glued the flowers and leaves as shown. The leaves are adhered using glue and flowers using foam adhesives. 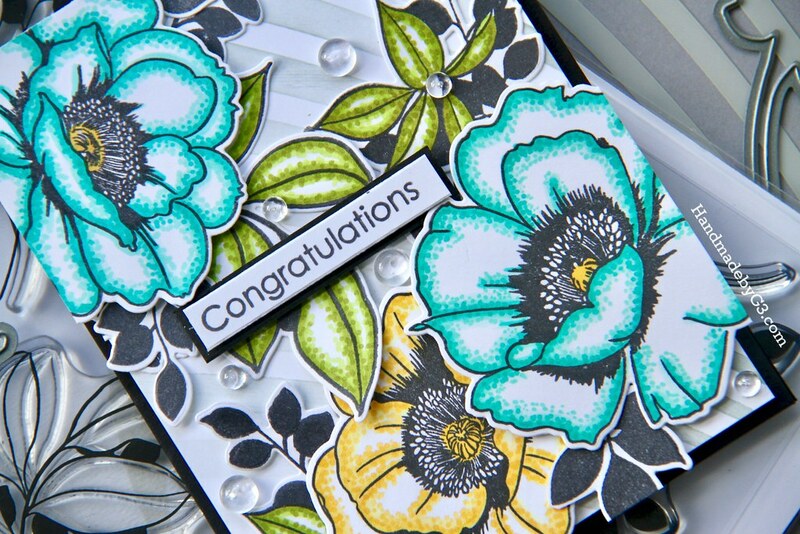 I let the flowers and leaves go beyond the panel as well as the card front. I adhered the panel to the black card base using craft foam. Then trimmed off the diecuts hanging off the card base. 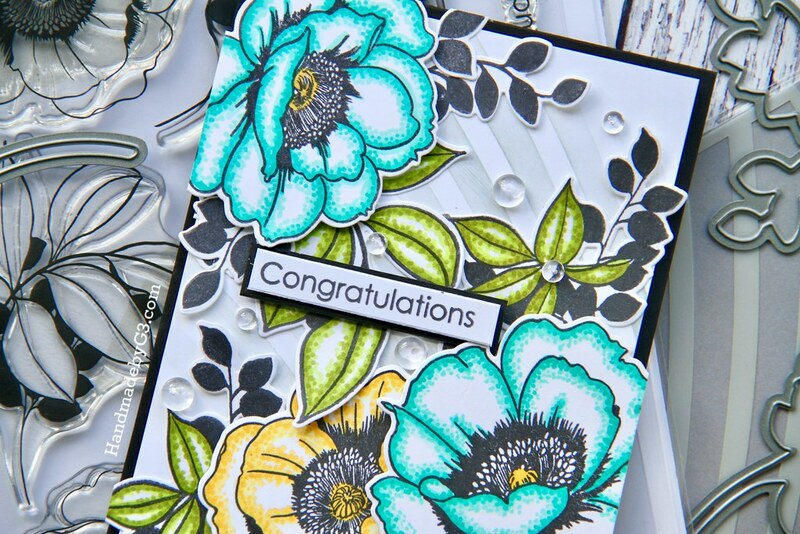 The sentiment also from the stamp set is simple stamped using Altenew Crisp Black ink on white cardstock, trimmed and matted with black cardstock. I adhered this strip using foam adhesives. Finally a few clear droplets to finish off the card. Here are more photos of the card. 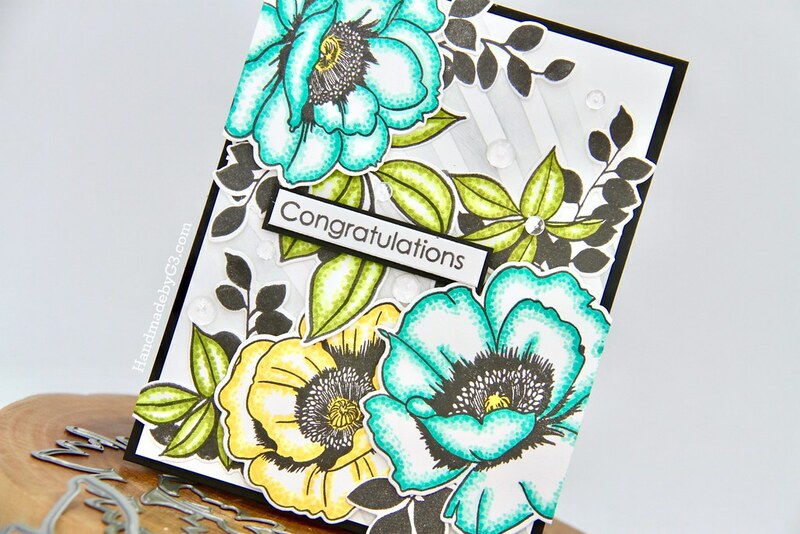 I love the texture on the flowers and all the white space. All the supplies used to make this card are listed below. Thank you very much for taking the time to visit my blog. 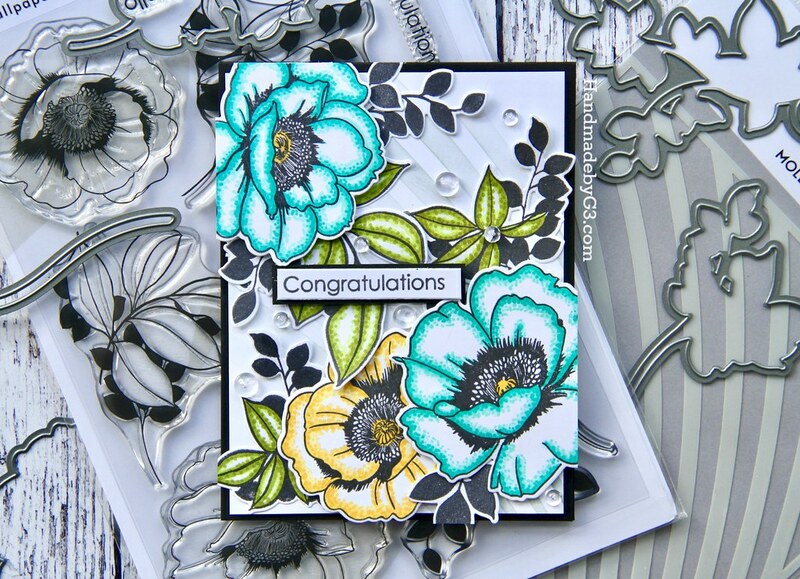 Love the texture you added – really makes the blooms special. I love the subtle background. The finished card is awesome. Wow!!! This is stunning and gorgeous! Love the background and flower.